User-generated content (UGC) is so overlooked but is by far a dominant social media strategy that generates enormous results for businesses. If you know how to use (UGC), it most definitely will create an upward spiral of increased social media engagement and more social media followers. So I have a question for you… Are you taking advantage of user-generated content to sky-rocket your social media engagement and social proof? Nine out of ten online consumers trust organic, user-generated content (UGC) way more than they trust traditional advertising methods and posts. So in other words, your social media audience would rather hear from your existing customers instead of you. Want some further proof of how people trust user-generated content more? Three out of four people rely on social media for their pre-purchase decision before they decide to buy a product or service. That is 74% of all consumers. Based on this data, user-generated content is a definite way to win over your customers, clients, and prospects, right? Thankfully, in order to get user-generated content, it’s just about one of the most un-costly ways to get increased engagement and followers all while still being one of the most highly effective tactics to guide you to get more loyal fans that result in more buyers for your product or service. Bryker Hyde sees the value in user-generated content. In fact, we boosted their Instagram engagement by 754% using a UGC strategy. I’m going to show you how to leverage user-generated content to increase social media engagement and followers the same way we did for Bryker Hyde. But before I do that, you’re going to need to understand why getting social media engagement and followers should even matter or be an importance to you and your business. Why do brands need a social media following? It makes sense, that social media is the second biggest driver of referral traffic to websites coming in at over 25% of the total number of referrals from all sources. (Second only to search.) And Facebook is now the leading driver of all referral traffic at 52%. 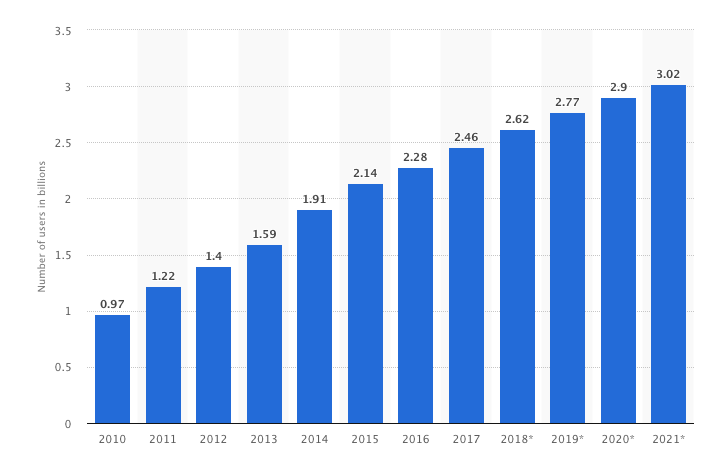 But with all those staggering numbers many marketers and agencies still don’t see the value of investing their time and energy in social media as a content marketing and conversion strategy to reach their desired results. The research shows that only 2% of brands meaningfully engage with the users on social media and yet 53% of consumers that follow a company on social media feel more loyal to that brand. Whether it’s a matter of time, a realization to the value, or just a simple oversight that sparks an eye-opening moment, that other 98% of businesses who are ignoring social media engagement need to give it another look. Because if you’re in that 98% your missing out on a major line of results for your business. Now, why should you spend the time and effort in focusing learning the social media field when you’re already knee-deep in the other marketing tactics? Because 74% of consumers use social media to make purchasing decisions… That’s Why. So are you still unsure if user-generated content is worth using for your business? Remember the 754% uptick in social media engagement that I mentioned earlier? We used a user-generated content strategy to increase Bryker Hyde’s social engagement. Another larger brand you may know that does this is Toyota they put a user-generated content strategy to work for their brand and increased Facebook Ad engagement by 440% with UGC. Toyota’s agency only had a goal to increase engagement by more than 300% initially on their user-generated content plan. We were confident leveraging authentic user-generated content would attract a positive engagement from our audience, but even we were surprised by just how much more effective it was. We’re thrilled with the results and proud of the campaign we were able to deliver for Toyota. Alright, so what do you need to do in order to achieve similar results with your business? Start getting your marketing efforts involved with social media and build your social audience by letting your users speak for you, rather its an expression through photo, a video, tweet or voice. Because it’s free marketing… Use it as leverage! I need to share one thing before we go any further… if you haven’t already set up a social media account for your business please make sure to use a name that is relevant or a variant of your business’s name. Could you imagine if Nike chooses a social media name like @TheNike6 or @JustNike9? No one would be able to find and follow them. Running hashtag contests are an easy and great way to get fan growth, promote your brand and create trust. Most Instagram contests that incorporate hashtags grow 70% faster than those that don’t. Almost everyone uses hashtags. You just have to get your audience to start using the right hashtags for your contest. Make sure the rules are clear… You need to state that in order to win they follow the rules rather that’s following your page, like your most recent post, or comment saying why they want to win. Choose a winner at random. Promote the winner along with the great prize they won by posting on social media and then offer a glimpse to your next contest which will start getting your followers to pay attention to your page because they want to win a giveaway. Here’s an example of a contest with that generated over 1,844 email entries in less than 3 days. Don’t forget to add in extra ways to drive followers, website traffic and engagement through social sharing. 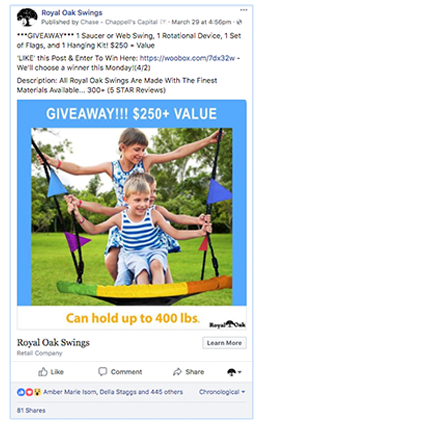 At the end of the landing page where the giveaway was hosted we had a call to action that said: “Want to learn more about royal oak swings click here to visit the website”. That line of text alone drove over 7,900+ website visitors. After you’ve pulled in all of these new followers with your clever contest, then what do you do with them? If you aren’t sure how to start, Chappell Capital can help you design the right contest with the right hashtags for your brand with our Facebook and Instagram services that are done for you. Asking your users questions is another way to generate more user content and increase social media growth. But if you ask a few thoughtful questions and keep the conversation going, the likelihood of another date is much higher… So make sure you are asking questions in the comments and engaging with your users so you can start getting more content. Most social media pages almost always post and promote themselves. Most brands don’t ask enough questions of their following. If you don’t ask any of your followers to engage positively with you, then they won’t. First, you need to know who your audience is. There are many ways you can get information about your audience through Facebook & Instagram insights. I’m not going to give a how-to on that but here is an article. Next, make sure you frame the questions you are asking in a way that ensures a positive response for them. For example, with a lot of our clients’ social media posts, we always ask questions to start getting user-generated content. 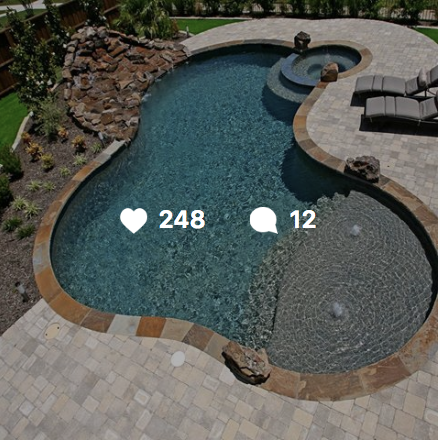 Check out this post we did for Dugger Pools. The post received 248 likes, 12 comments with positive user-generated content. Not too bad for a post that had a follower count of 300 at the time. When you consider social media for user-generated content to start you can always get your employees to help out in the beginning. Think about it. Who else do you know that is closer to your brand than the ones who work their everyday? Employees! So encourage your employees to start promoting the brand-related content that you post on social media as well as posting generated content but make sure it’s going to have a positive impact while at the same time try not to dictate what the employee-generated content should look like. Most customer-centric companies have actively engaged employees to posts made by the companies they work for. Actually, 80% of employees report daily “engaged” or “fully engaged” to their companies from social media. T-Mobile launched an employee-generated content campaign that saw a 140% increase in Facebook likes and 150% growth in LinkedIn followers. If you want to get started with increasing social media engagement and followers then employee-generated content is one way to do so. Many companies like Google and Virgin have seen huge success with the use of the hybrid method of employee-generated and user-generated content. Each of these companies saw a lift in their social media engagement and followers just after the first month. If your employees are posting positive things about your brand then your customers most likely will feel positive about your brand. This also makes everyone a brand marketer in a way whether you’re a company of 10 or 10,000. It can unify the brand. Now that you’ve let your employees show their brand pride to help boost your social engagement and following, let’s look at how we can increase your customers bragging rate about your brand! If you desire to engage authentically with your users, you’re going to need to understand that what’s said about your brand on social media is not always what you will expect. Make sure to give your customers a chance to be truly creative when there are posting about your business. It’s a great way for women to show off their new swimwear and for Aerie to showcase how loyal their followers are to the Aerie brand. 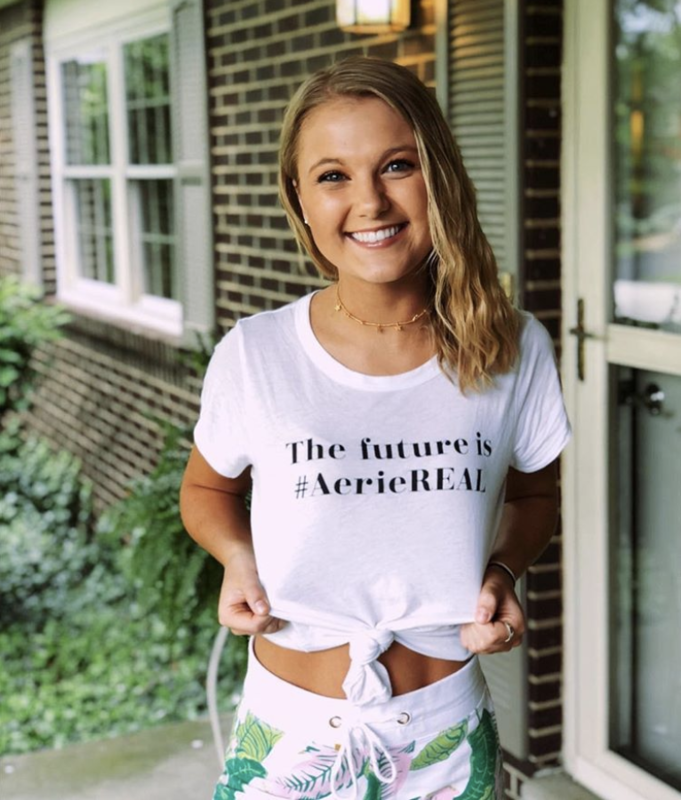 This result of user-generated content campaign, Aerie has increased their followers and is becoming a super successful brand in their market. One of the best part things about this is how the photography and creativity are supplied by users. 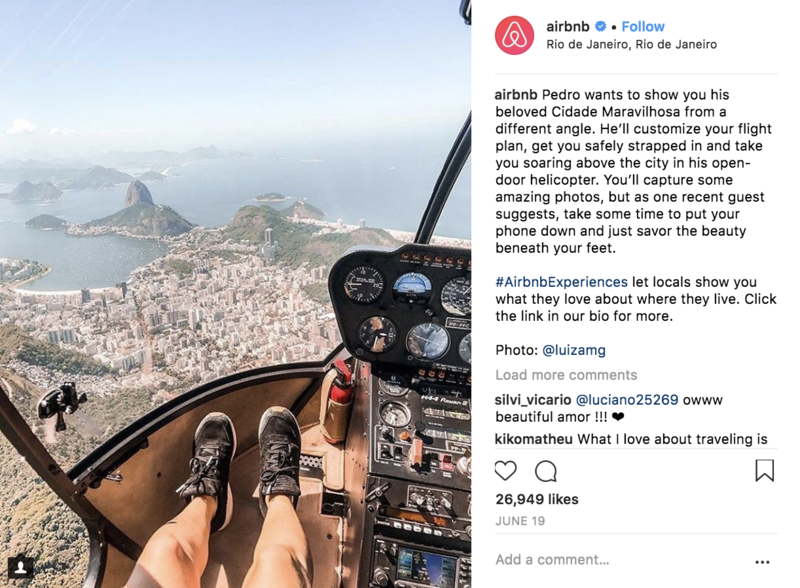 Just about everyone has now heard of Airbnb, they have created many campaigns that take this step a bit further by positioning their customers as the ‘Local Experts’. Airbnb might not sell a physical product but they do expertly sell an experience through beautiful, user-generated content. That leads new customers to book a nite stay through Airbnb. It’s simply done by letting their following post content about experiences and stories they had. The next time you see a post or content that you love that was made about your brand, reach out to the owner of that content and ask if you can repost by giving them a shout out or just ask if you can buy the rights to the photo. Then it’s yours to share to your following and use for other promotion as you wish, and it creates authenticity of the UGC spirit. The most common way to contact the user is usually through DM or as a comment on the post. User-generated content gets really popular during the Seasonal holidays and campaigns can create excitement about a product or limited-time branding, which in return, increases sales and social media growth. Shopbop is a good example of how to get User-generated content during the holidays. They encouraged customers to share a photo or video that showed how they get dressed up during the holidays with Shopbop. It was also a brilliant sales move because the followers resonated with the post and they had to get the outfits to share their posts. Another great example of limited-edition brand posts from earlier is JCrew’s post. Whether or not they knew the pj’s were fan favorites during the holidays so they capitalized on the followers by getting more user-generated content through the comments on their post. Just think about it. You’re standing in line in a store, and what do you do while you wait? You casually look scroll through social media while you wait, right? Four out of five-holiday shoppers look at their phones regularly throughout the day during their time spent in stores. You need to be the first thing they see when they start to scroll. Here’s why, if you want to try your chance for a seasonal campaign, you can either aim for a particular brand element like (JCrew) or center your campaign around a specific event. For example, retailers had pulled in almost $8 billion on Black Friday in 2017. That is because retailers know shoppers are already in the shopping spirit — you just need to get them to think about your brand. While they are out. The studies show that consumers are 137% more likely to buy from a brand if they see consumer photos of a product. So social media is definite place retailers look for getting that first image in their mind right as they start to shop. Why not create a few posts to encourage user-generated content on one of the biggest shopping days of the year? Just capitalizing on the Black Friday and Cyber Monday alone can create a shopping craze, Amazon is notorious for reaping the benefits. As a result, Amazon was one of the most talked about brands on social media during black Friday, thousands of shares, posts, comments and chat about Amazon. 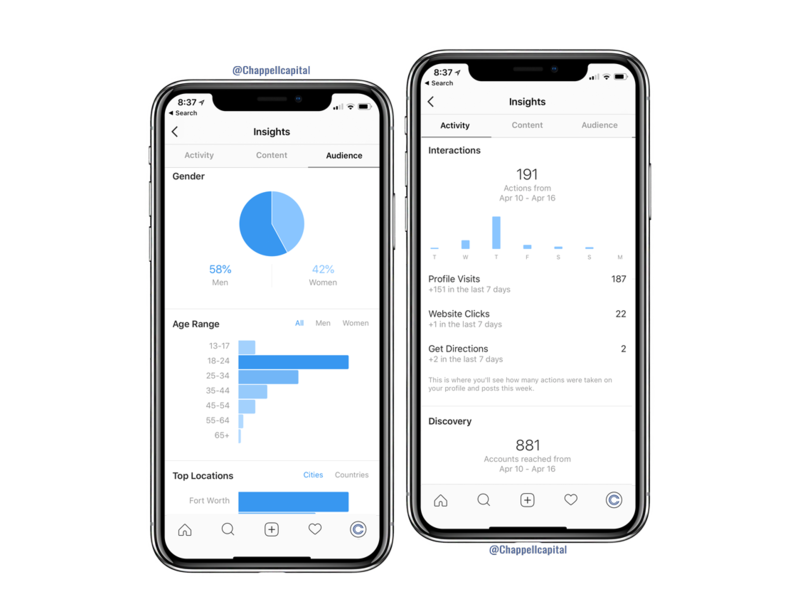 Each of those metrics is a piece of user-generated content that goes towards increasing their brand traffic, engagement and following. If you recall the User-generated content campaigns we’ve looked at and walked through, you’ll notice a common theme: The user-generated content almost always revolves around the imagery. Why not use that as a platform for your logo to get put in the eyes of millions? Well, have you ever heard of the famous saying “banner blindness?” The whole concept is that consumers have programmed their minds to block out and ignore banner ads. There are a number of scientific reasons why people hate banner ads. The good part is there are so many you can get around many of these objections and blindness with user-generated content. Everyone knows the Coca-Cola campaign that went nuts on social media. Well, one reason is that they placed their logo in a very strategic place with their “Share a Coke” campaign. Users all over the world photographed and posted pictures of themselves with their names on the coke bottle. It was quite easy for anyone who saw a post to find out where they could get a bottle as well. It launched Coke to 998 million impressions on Twitter alone. In the process, it created a storm of posts that encouraged people to participate in the campaign. Emma Roberts was one of the many celebrities who participated in the campaign. The point is you need to give your audience a good reason to why they would want to share your logo, and if you do that then you will! People have always enjoyed quizzes. Quizzes affect our brain in a way that gives us an immediate release of enjoyment at the end of the quiz. One of the benefits of quizzes is that they drive up to three times more cold traffic than a regular blog post. You can harness that desire for attention into a successful user-generated content campaign by making sure you create content that is interesting and engaging enough to entice users to participate. A great example of this is Elephant Pants. One of their recent quizzes was shared on social media a thousand times. Which turns into a lot of free marketing. The special structure of a successful quiz is very simple: start making your quizzes easy, fun to read, take and share. And most importantly don’t forget to include a call-to-action to share the quiz or post the results on social media because that’s where the leverage and true value comes from. There are many ways you can create quizzes here is an article on how to do so. Guess how many consumers prefer to buy from brands that support a cause? Over 90% of consumers do. 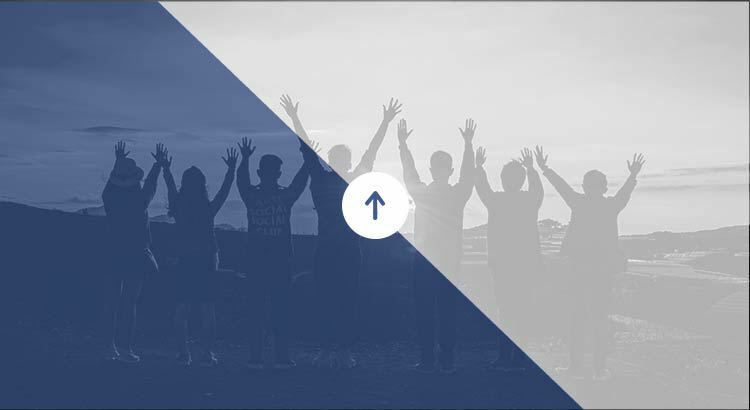 In addition to making the world a better place, followers will join together and rally behind a cause that attracts new customers, gains attention from media outlets, and increases brand loyalty with existing customers too. Content Boost wrote an article on how CSR increases consumer engagement with your social media. Here is an example from Target. With one simple post on their website asking users to share on social media in support of their movement they got a ton of publicity and shares while building a feeling of unity between users and the brand. Find a cause your brand can enthusiastically support and like-minded social media users will stand in support with you. Are you leveraging your share of user-generated content from the two-plus billion social media users to help drive your sales, followers, and engagement? 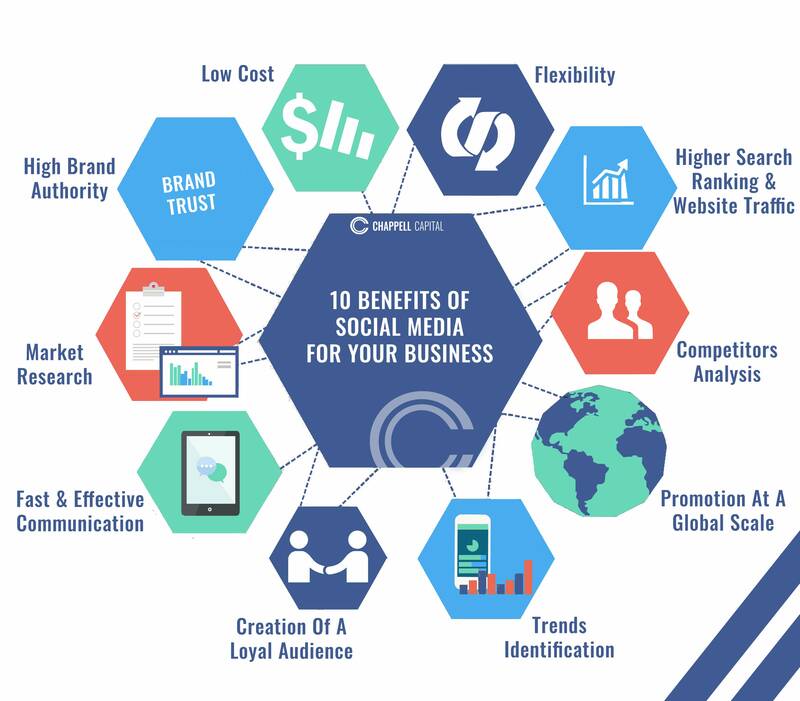 Too many businesses rely on their own created content to drive social media growth for their business. User-generated content not only takes some of the pressure off of content creation, but it also builds credibility, trust, and loyalty with your audience and that naturally attracts more followers and engagement. So do you want to see the kind of social growth like Bryker Hyde, Royal Oak, Target, Aeria, JCrew, Coke and others that I talked about in this article? It’s time to start thinking about user-generated content as an offensive social media strategy use instead of a strategy that needs defense against the menace of what people might say about your brand. Be open to letting people share with their peers and talk about your amazing business on social media. What strategy or current strategy are you using to encourage user-generated content?